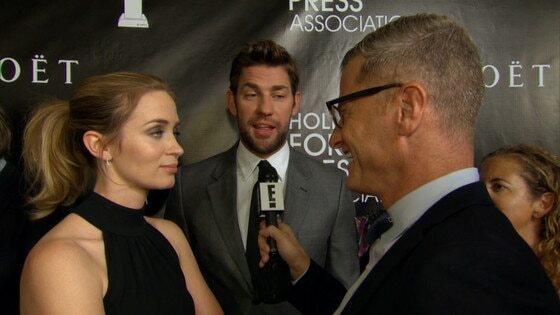 John Krasinski, is that you?! Gone is adorably goofy, somewhat nerdy, clean-shaven Jim Halpert from The Office, replaced by a hulking, scruffy, true Adonis of a man in 13 Hours: The Secret Soldiers of Benghazi, as seen in a new, shirtless photo from the movie. Stephen Colbert had given a glimpse of the image on The Late Show With Stephen Colbert earlier this month, during which the actor joked that wife Emily Blunt hate his new, buff body. Krasinski plays a CIA contractor and former Navy SEAL in the new film, his first major leading role. Krasinski had said he trained twice a day, five days a week, for several weeks to get into shape for the role. He told Men's Fitness, which features him on the cover of its January/February 2016 issue, that he went from have 26 body fat to just 5 percent within months. The movie was directed by Michael Bay and also stars Orange Is the New Black alum Pablo Schreiber. 13 Hours: The Secret Soldiers of Benghazi is set for release on Jan. 25.